Today, CDC released new data on self-reported adult obesity prevalence for all 50 states, the District of Columbia, Guam, and Puerto Rico. The 2017 Adult Obesity Prevalence Maps show that adult obesity prevalence across the country remains high and differs by race, ethnicity, and education. In 2017, 7 states reported adult obesity prevalence at or above 35%. Turning the tide on obesity will take a comprehensive effort by all parts of society. The data come from the Behavioral Risk Factor Surveillance System, which is an ongoing, state-based, telephone interview survey conducted by CDC and state health departments. Height and weight data are self-reported. In 2017, 7 states reported an adult obesity prevalence at or above 35 percent: Alabama, Arkansas, Iowa, Louisiana, Mississippi, Oklahoma, and West Virginia. This is up from 5 states in 2016. 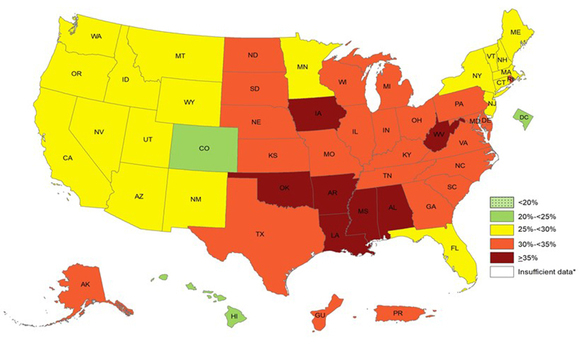 Five years ago, all states had obesity prevalence lower than 35 percent. Obesity prevalence ranged from a low of 22.6 percent in Colorado to a high of 38.1 percent in West Virginia. Adults with obesity are at an increased risk for many serious health conditions, such as heart disease, stroke, type 2 diabetes, some cancers, and poorer mental health. Children with obesity are more likely to become adults with obesity. Obesity costs the United States health care system over $147 billion a year. In addition, research has shown that obesity affects work productivity and military readiness. Turning the tide on obesity will take a comprehensive effort by all parts of society. State and community leaders, employers, government agencies, healthcare providers, and individuals all have an important role in preventing and managing obesity. To protect the health of the next generation, support for healthy behaviors such as healthy eating, better sleep, stress management, and physical activity should start early and expand to reach Americans across the lifespan in the communities where they live, learn, work, and play.